Creepy?! Ugly?! Sacrilegious?! Not many people are happy about the mascot character for the Commemorative Events of the 1300th Anniversary of the Nara-Heijyoko Capital  to be held in 2010. The character was designed by a sculptor and professor at Tokyo University of the Arts, Satoshi Yabuuchi , who is one of twelve guest designers invited by the Association for Commemorative Events of the 1300th Anniversary of the Nara-Heijyokyo Capital . The name, SENTO-Kun, was selected out of over 14,000 public applicants by the association of the event on April 15th. Ever since the announcement of the official mascot character in February, many, including media and religious groups have expressed negative opinions about SENTO-Kun. Needless to say, many bloggers responded to the announcement of the mascot character. The monster-like mascot character designed by Yabuuchi for the Commemorative Events of the 1300th Anniversary of Nara-Heijyoko Capital is seriously gross. Nara prefecture has become the laughingstock. .. It’s really grotesque. People who are ok with this must be people who have nothing to do with faith. Sentokun from YouTube clip . Some people have positive views about Sento-kun and describe it as kimokawaii (creepy but cute) or even as adorable , but they are not the majority in the blogsphere. An online community was created on Mixi  to call for a withdrawal of the mascot selection by the event association immediately after the debut. Now the community has over 1000 members, and it launched a website called “Sen Sanbyaku-nen Kinen wo Sukuu Kai[jp] (The 1300th Anniversary Support Group)” on March 1st. Besides the unpopularity of the mascot character design, the group criticizes the Association of Commemorative Events for spending over 5,000,000 yen in tax money to buy out the copyright from Mr. Yabuuchi. The group gathered petitions on the streets to call for a withdrawal of the mascot character design, and conducted a questionnaire survey on the design. 5,000,000 yen for the design fee. On top of that, Dentsu, an advertising agency, preselected Satoshi Yabuuchi and suggested the design. It was behind the scenes. I would like to know what the flow of money has been like. I mean, how much of residents’ tax money went to Dentsu in the process of the agency selecting Mr. Yabuuchi? 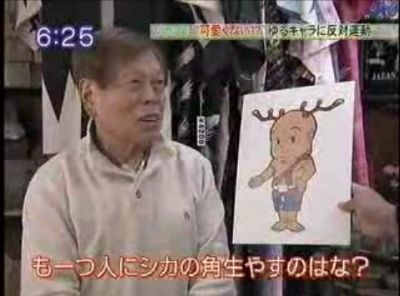 Neither the Governor of Nara-prefecture nor the Association has any intention of changing the mascot character, and the Association issued a statement asking for support from the public for Sento-kun and for the event. These debates around Sento-kun certainly helped to attract public attention to the event.